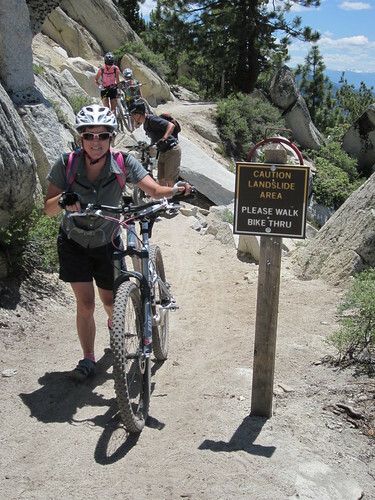 Our extended winter left a lot of snow in the Sierras, and mountain bikers have been waiting week after week for the snow to melt enough to ride the trails in the high country. 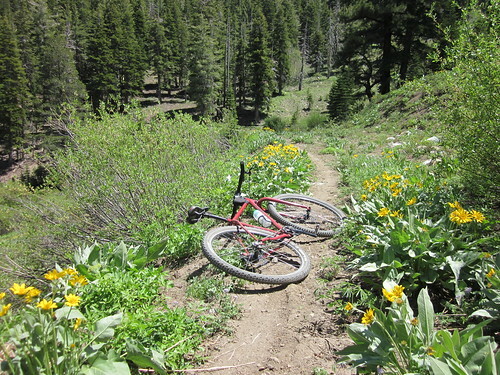 Although many sections of the Tahoe Rim Trail are still under some snow, the Flume Trail is finally open! 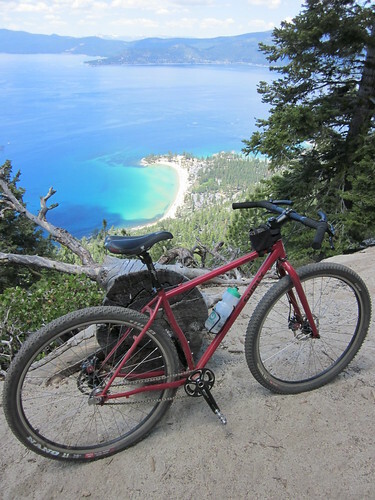 On the morning of June 26th, the Northridge Riders assembled for an epic ride that took us from our driveways, all the way up to the Flume Trail 1,000 feet above Lake Tahoe, and then back home again. Due to high levels of excitement and anticipation, everyone was on time for the ride and ready to go. This included me too, which can be a rare occurrence. We huddled together briefly for a photo, and then got underway. You could sense the enthusiasm. I thought everyone was pedaling a bit too hard for the amount of miles ahead of us. Thankfully we only made it about a mile before we had to pull over and make minor adjustments to derailleurs and shoes. 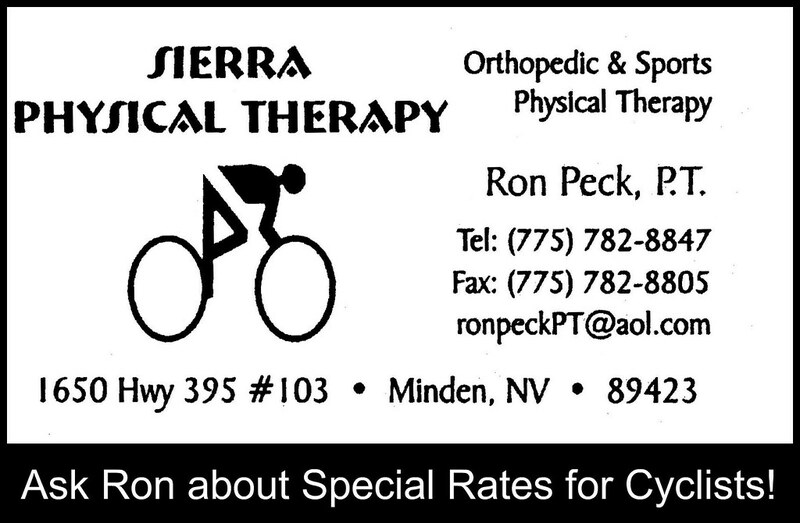 Once on the road again the pace was more relaxed, and we pedaled through the scenic west side of Carson City. The adventure seemed to begin when we reached the end of the pavement on Kings Canyon Road; the feeling of leaving the security and familiarity of town, and heading out into the unknown. We were glad to have gotten an 8:00 AM start, because the temperature was already starting to get warm. I took comfort in knowing we could refill our water once we got up to Spooner Summit. 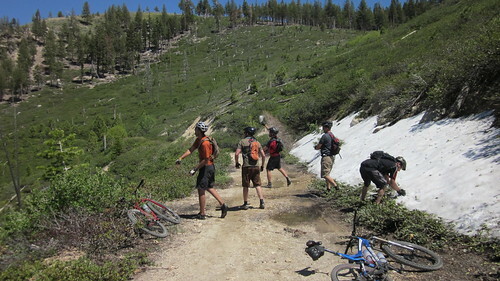 Kings Canyon steadily climbs out of Carson City, and you gain altitude fast. The gravely road switchbacks up the side of the canyon, and transitions from the desert feel of the valley below into the forest of the Sierras. 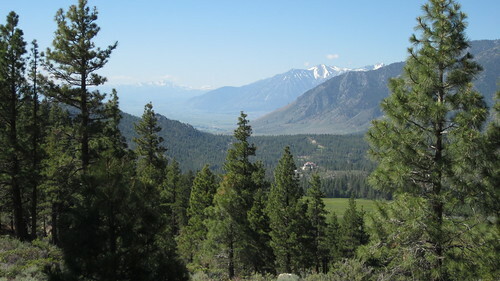 Once you climb out of Kings Canyon, you have great views of the Carson Valley to the South. The road to Spooner from here is easier going as it parallels highway 50 below, but the roadbed is mostly loose decomposed granite. The sand can become deep at times, so you have to pick your way around the road to find the best traction. As you near Spooner Summit, there is a lot more shade, and several creeks cross the road. It was at this point that I started feeling that I was far away from home. Kings Canyon to Spooner Summit was the longest leg of the journey. We had a slow and steady pace and our legs were fresh, but we started feeling the burn at the end of the 14 mile climb. 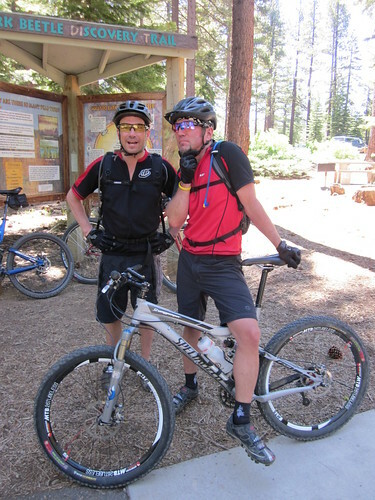 We were really looking forward to the ice cream at the Flume Trail Bike Shop. We finally reached Spooner Summit, joined up with the Highway, and then bombed down to Spooner Lake State Park. 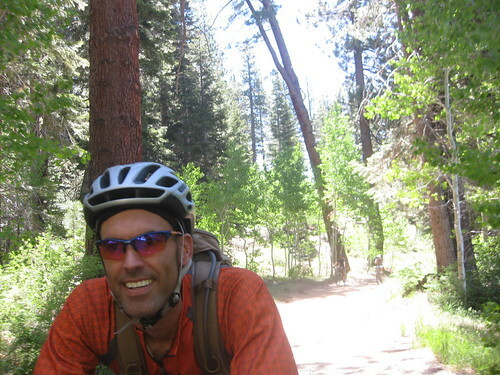 We each paid our $2 entry fees, and rode over to the Flume Trail Bike Shop. The first order of business was to refill our water and get some ice cream! When I got over to the freezer though, it was nothing but a big white empty void. I suddenly understood how Christopher Columbus probably felt when he promised the crew that they would reach land by the next morning. Scott J glared at me with a look of betrayal. “You promised…”, his eyes said. The guy at the shop heard our discussion, and told us that the ice cream delivery hadn’t showed up for the week. It was late. I’m not certain if the guy at the shop sensed our sadness or was trying to avoid the bloodshed of a violent mutiny, but he said, “Hold on guys…” as he walked over to a freezer marked Employees Only. He pulled out last season’s freezer burned treats, and offered them to us for free! My frozen yogurt bar was encrusted in ice crystals, but tasted way better than it looked. We sat outside and enjoyed our frozen snacks. Two dollars to enter the park, and they give you free ice cream. You just won’t find cheaper entertainment anywhere. The steep climb ahead didn’t seem so bad now. Sometimes when I do a ride that I’ve done before, I like to try something different. Maybe I’ll change the route up a little bit, or try it on a different bike. I recently built up a new single speed, and I’ve had a hard time riding any other bike. It’s a lot of fun. For days leading up to this ride, I was trying to get the courage to try this route with one gear. Additionally, I really haven’t done any long rides this year, so I wasn’t sure if I could do it. I finally committed to riding the single speed the night before after I ran the idea by Scott R over a beer. He seemed surprised by the idea, but he didn’t talk me out of it. I figured I could walk if I needed to, and half of the ride would be downhill, right? I made it up Kings Canyon easier than I had expected, and only the grueling North Canyon was left. Overall, the climb up North Canyon went pretty well with one gear. I was riding up ahead with Scott R, and most of the steep parts were short. Until we got to the final climb, that is. The final climb is less than a mile, but it’s really a granny gear climb. The steepness spiked my heart rate quickly, so I looked around for things to take photos of in an effort to rest. One by one, the rest of the gang caught up with me and passed me, motoring up the climb in their tiny gears. Thankfully, the grade eased up at the end, I was able to ride up to the saddle. Most of the climbing of the day was done! We had a nice break at Marlette Lake, and everywhere around us was a beehive of activity. Hikers and cyclists were all around the lake enjoying the day. We even saw one small group using a rope swing to jump into the lake. Brrrr. No thank you! 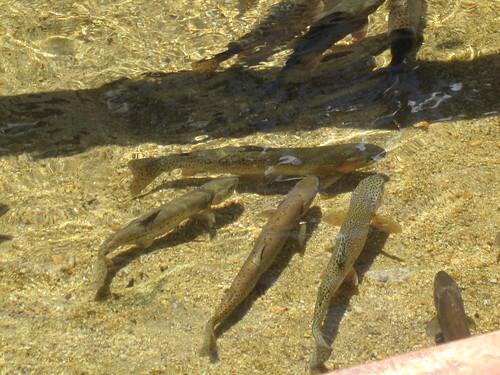 The Nevada Division of Wildlife was busy at the south end of the lake at the Trout Spawning Station. Marlette Lake is used as a hatchery for Rainbow and Cutthroat Trout, and there were several fine specimens swimming in the inlet creek. Rather than have these brood stock fish at a hatchery, they are raised in the lake in a completely natural environment. Hundreds of thousands of eggs are produced by these fish each year for Nevada fisheries. 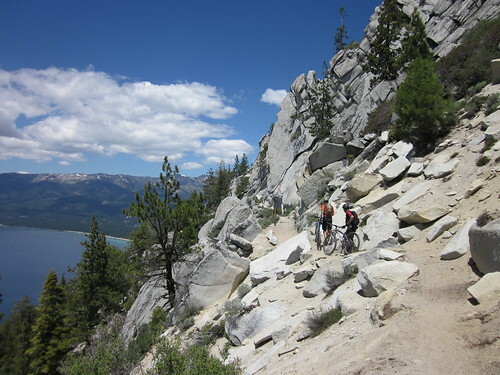 As we pedaled along the west shore of Marlette Lake, we rode past the last patch of snow on the trail. It was nearly melted and was easy to go around. When we reached the dam, the high water had the trail submerged. A couple of us ported our bikes over the rocks, but those of us who didn’t mind squeaky chains and wet feet pedaled on through. It was a busy day up on the Flume Trail, and we waited our turn for the traffic to clear. There’s a fun section that descends from the Marlette Dam, makes a sharp switchback over some granite boulders, and then finishes with a bridge crossing by a waterfall. It’s always fun to try to clear this section without putting a foot down, so we were patient as the riders ahead of us disappeared down the trail. 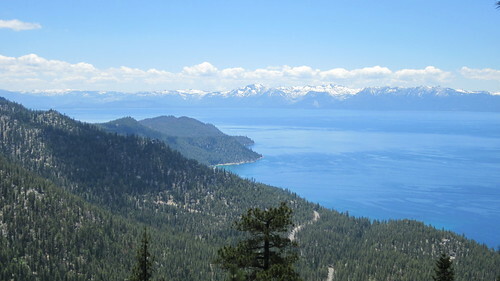 Just across the bridge, the Flume Trail begins, and riders are offered stunning views of Lake Tahoe. I always enjoy taking someone new on this trail and watching their jaw drop as they come around the first corner to view the lake from 1,000 feet above it. You try to tell them how beautiful it is, but it can’t be fully imagined even by looking at a photo. It’s just something you need to see in person. 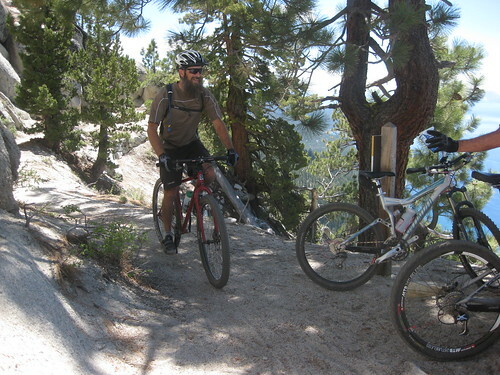 While the Flume Trail is narrow and cut into the side of a steep mountain, it is smooth and well maintained. There is one hazardous rock slide area, but it is well marked. 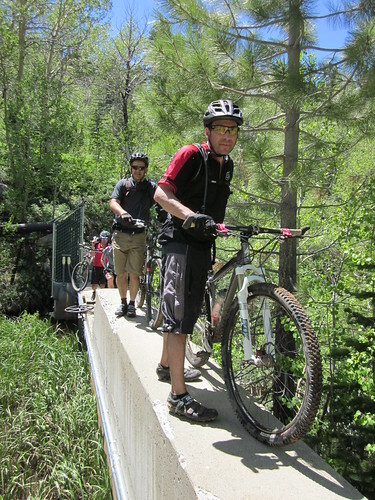 The biggest challenge of the Flume Trail is to keep riding and not stop constantly to take pictures or enjoy the scenery. When we arrived at Tunnel Creek, we began our final ascent of the day. The hill is only .6 miles, but it’s steep, and our legs were protesting any more climbing. 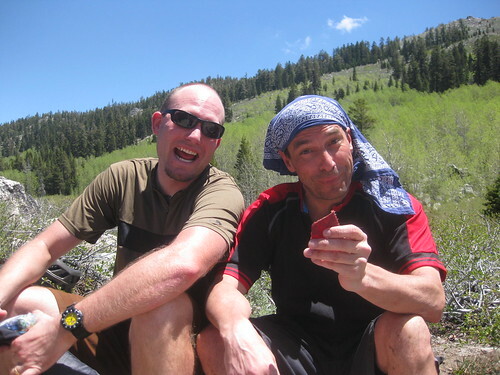 We took a break at the saddle near the intersection of the Tahoe Rim Trail. The trail drops down a steep sandy road after leaving the saddle at Tunnel Creek, but soon becomes one of my favorite sections of this route, the Red House Flume. While the Marlette Flume is up high and exposed, the Red House Flume is shady and enclosed in a more heavily wooded area. It’s a pleasant ride all the way to Franktown creek with many flowers and streams to enjoy along the way. At the end of the Red House Flume Trail is Franktown Creek and a skinny concrete dam. Riders must dismount here and carry their bikes across. It has been made more treacherous by a recently built structure on the upstream side enclosed in a chain link fence. It feels like you’re going to get tossed into the creek far down below. 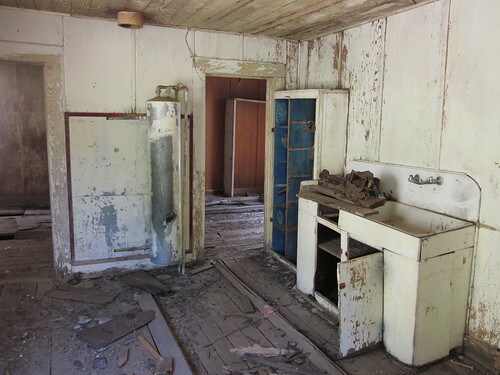 This is the only part of the ride that made me feel uneasy, and a different route to get to the Red House may be more desirable. Directly below the Red House Flume is the Red House itself. The Red House, as you might imagine, is painted red. 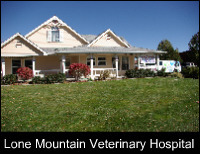 But it is reportedly nicknamed for a caretaker named Harry “Red” McGovern, a past caretaker along Franktown Creek. The system of tunnels, dams, and flumes that brought water from the Sierras to Virginia City required constant monitoring and repair, so caretaker stations were built along the water route. Hobart Station, or “The Red House” was one of these stations. 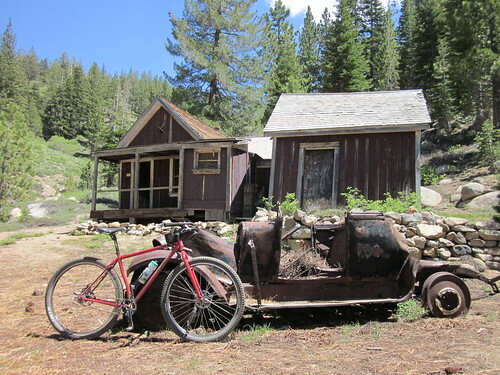 There is a shaded picnic table at Red House, the babbling Franktown Creek is nearby, and the remains of an old 1924 Dodge Roadster peacefully rest out in front of the house. It’s a perfect spot to take a break. After taking some photos at Red House, we began the next leg of the journey. After a short descent down Franktown Creek Road, the trail becomes Tanks Road, a long, mostly flat road that follows the contour all the way to the water tanks high above Lakeview. 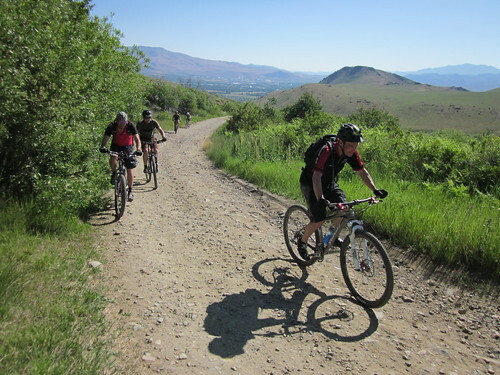 The trail here is easy going, and you have plenty of time to enjoy the views of Washoe Valley below and Slide Mountain to the North. One particular photo stop was near a snow covered northern slope. Scott R suddenly got the urge to make some snowballs and commence target practice on an old dead tree that was several yards down the hill. He couldn’t seem to hit it, and before long the whole gang was over there making snowballs and trying to be the first one to hit the target. In the end Brent was the winner, and I believe Scott may owe him five bucks. Once you reach the water tanks, the pleasant road becomes really steep. It’s a fast descent all the way down to Lakeview from here as the road twists and turns down the mountain. 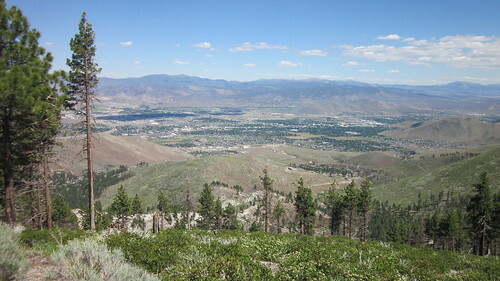 We got our first glimpse of Carson City since Kings Canyon, and it was still way below us. Several minutes later we had reached the pavement of Lakeview, descended down Combs Canyon, and finally arrived back in the City. 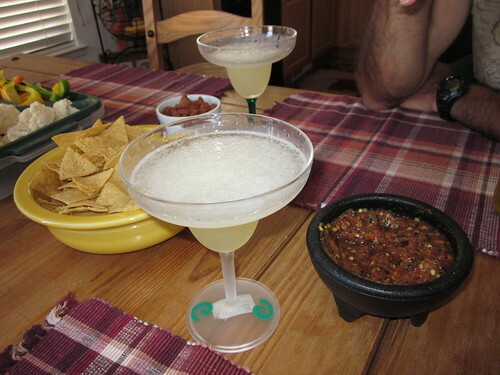 We finished our ride with a celebration, enjoying Brent’s famous margaritas, chips, and salsa. The riders that brought along their GPS units recorded 42.5 miles ridden, 7.5 hours out on the bike, and 4,491 feet of elevation climbed! There aren’t too many places where you can have this much fun all day and enjoy spectacular views, all for the low price of two dollars. Especially when you throw in the free ice cream! 42.5 miles, 7.5 hours, 4,491 feet of elevation gain! 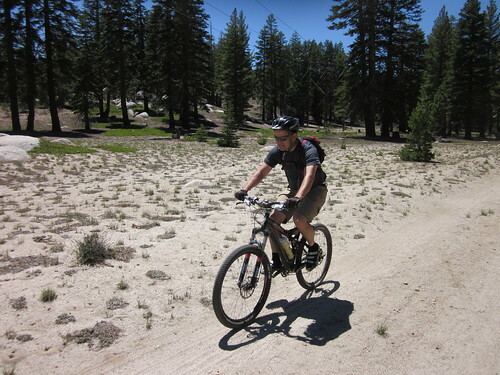 For riders looking to trim off some miles or climbing, Spooner Lake is a great place to start. 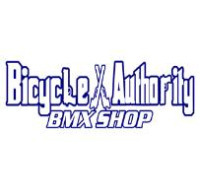 Flume Trail Bikes has a full service bicycle shop, bicycle rentals, shuttle service, and staff knowledgeable with the area. Their website has full details including a great trail map, and can be found at http://theflumetrail.com. Special thanks to the Northridge Riders for a great day and sharing some of their photos! Thanks Jeff, it was a great idea and an amazing day! I ran across this group just as they were finishing the descent down Hobart. Laughing, cheering and all having a great time. Thanx all, it was awsome!! 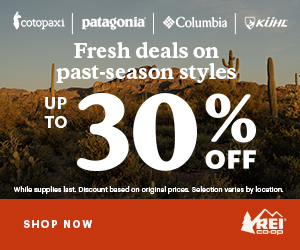 Now that’s some mighty fine looking trail! It looks almost as good as the post ride beverages. Well executed plan Moser….You are strong like bull as well. You don’t need no stinkin gears. man, that is an epic adventure. can’t imagine riding that with the SS so you are “monster” mr. moser! hope to get back there some day soon and maybe join you on such a awesome ride. great pictures as alway (cool to see some places i remember too!). Nice write up! Once again it is proven… Good friends = good rides. Scott R and I were saying that the group had a really nice dynamic that made the ride very enjoyable! Plus, I’m still impressed with your single speed triumph! 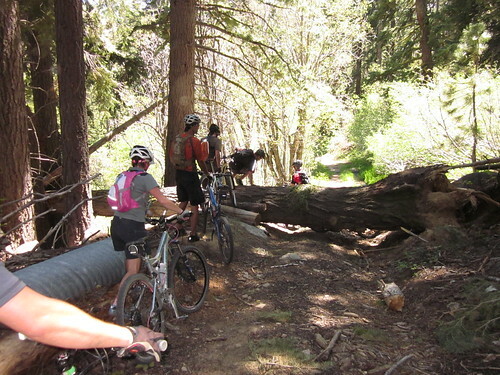 Especially after I helped everyone get their bikes over that fallen tree. That baby ain’t as light as I expected it to be! What an epic ride! Very nice! Well written and photographed Mr Moser, it’s hard for me to imagine a nicer ride. I would love to get up there some day and ride it with you. Brent will obviously need to do some work in the gym before attempting to lift a singlespeed Pugsley over those fallen trees. 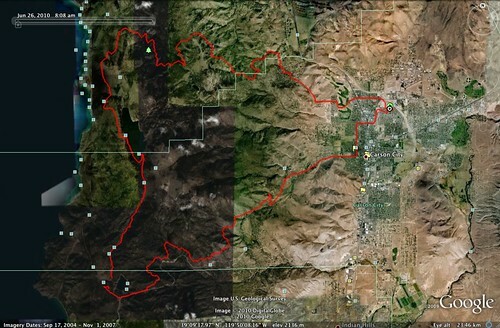 We just did this ride, minus the kings canyon section (we parked at spooner, biked down to carson city and drove back up). It was a killer, lots of down trees over the trail in the Redhouse area. 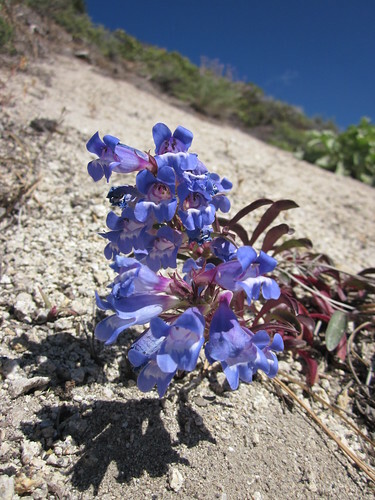 I cant imagine adding another huge climb up Kings Canyon! And on a single speed at that! The Kings Canyon section isn’t too bad. Especially if you get a nice break at Spooner. There are a few steep sections, but lots of gentle climbing. Highly recommended actually! Jeff – “The Red House could use a woman’s touch” – is EXACTLY what my mom said! Your photos are incredible! My maiden name is Sherry McGovern – Uncle “Red”, Harry McGovern, was my father’s uncle, my great Uncle. 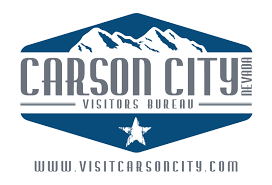 When I was young – about 8 or so – my family took a Chevy- Chase-like road-trip adventure from the southeastern suburbs of Chicago, IL to Carson City, NV to visit our dear, bachelor Uncle Red. Uncle Red took us with hi, as he checked the flumes/did his job along that trail. We must have collected 300lbs of the most incredible quartz rocks – brought many of them back in our station wagon. (Probably illegal!) I’ve had a rock fetish ever since! Jeff – thank you for writing about him. He was an amazing man. Helped me through college, wrote me letters for many years through high school and college. Truth be told, I adored him.